The data could provide Walmart with richer data on how its customers are responding to its stores. A server may receive, in near-real-time, baseline biometric data generated at a shopping cart handle, the baseline biometric data being associated with a user of the shopping cart. Yhe server might analyze 'real-time trends' based on data from multiple customers, such as if many visitors' heart rates are increasing when they enter certain aisles, if certain music is playing or when specific store associates are nearby. Walmart wants to track how its customers are feeling as they peruse the snack aisle. 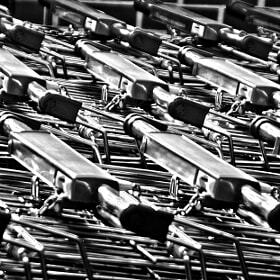 The retail giant filed a patent for a internet-connected shopping cart that can measure and track biometric data. Not only can it keep track of your heart rate, but also your temperature and how fast your pushing the cart. It describes a shopping cart being outfitted with a series of sensors that can connect to a server. From there, it would be able to alert store associates that a customer needs a hand, based on the biometric data they received from the shopping cart handle. The data could provide Walmart with richer data on how its customers are responding to its stores. 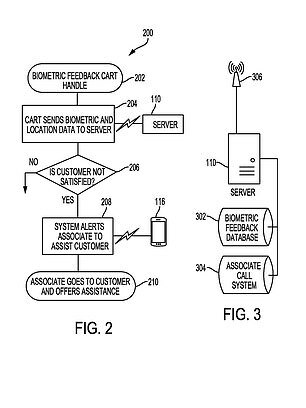 'For example, a server may receive, in near-real-time, baseline biometric data generated at a shopping cart handle, the baseline biometric data being associated with a user of the shopping cart,' the patent explains. That information is sent to a server, which performs 'an analysis' of the baseline biometric data compared to the additional biometric data. 'By this analysis the server can determine that a check on the user should occur, and can transmit a notification to at least one store associate to perform a check on the user,' it continues. And if that wasn't intrusive enough, an alert might be sent throughout the whole store. However, it's likely this feature would only be used in emergencies. 'If certain conditions are met, a notification may be sent over the store intercom,' the patent explains. A customer's biometric data might be stored and used to build a table over time, according to the patent. For example, store associates might create a table that includes any data concerning the customer's stress levels. 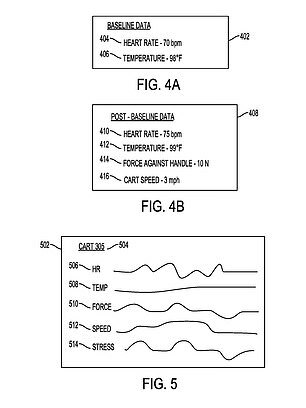 The patent also describes how the server might be able to analyze 'real-time trends' based on data from multiple customers, such as if many visitors' heart rates are increasing when they enter certain aisles, if certain music is playing or when specific store associates are nearby. 'This data can be communicated to store management, who can take action to improve the shopping experience,' the patent reads. IS WALMART PATENTING A DEVICE TO LISTEN IN ON EMPLOYEES? Walmart has raised the ire of privacy advocates with a new patent for an audio surveillance tool. The freshly filed patent describes the need for 'sounds sensors' and 'listening to the frontend' technology in its stores that can pick up on conversations between employees and customers. Using these recordings, Walmart would identify employees in the audio and study it to measure their performance at the company. 'A need exists for ways to capture the sounds resulting from people in the shopping facility and determine performance of employees based on those sounds,' Walmart explains in the patent, which was filed April 20, 2017 but only made public this week. 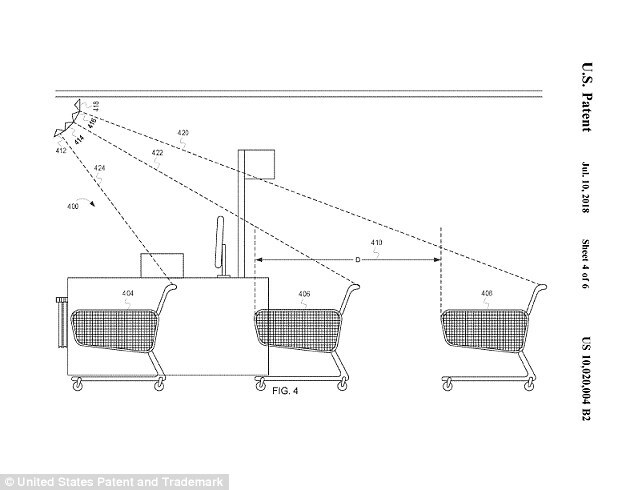 According to the patent, Walmart would use a sensor that picks up on interactions between employees and guests, as well as common sounds near a checkout, like beeps from a scanner, sounds created by bags and more. The sensor would then analyze the audio and use it to calculate a score on certain performance metrics. These performance metrics range from whether an employee made small talk with a customer to even things as creepy as analyzing the contents of the conversation, looking to see if the employee used a specific greeting or followed a script, the patent explains. 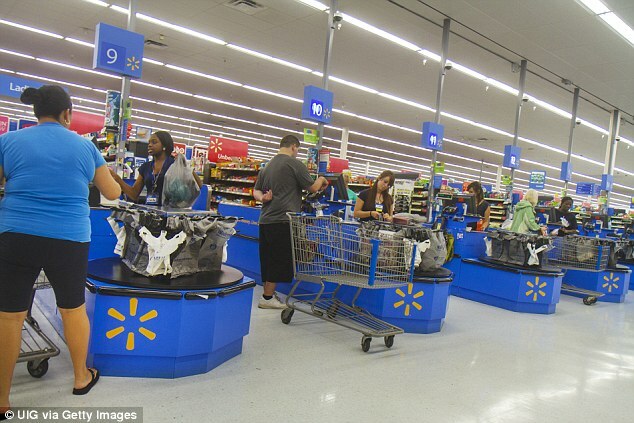 Walmart couches the 'listening to the frontend' technology as a way to cut costs by improving employee efficiency in its stores. 'Employee efficiency and performance can help decrease costs for a shopping facility as well as increase guest satisfaction,' the patent states. It would also pick up on audio like how far customers voices appear to be from the cash register, allowing Walmart to gauge how long the line might be. This would indicate the cashier's speed of moving through the line of customers, as well as signal whether they need to open more registers to accommodate for the flow of customers.